For most PC and mobile device makers, sound is a binary spec. Does it have sound? Yes? Good. Great audio is hard to sell because it doesn't lend itself to benchmarking or obvious prettiness like, say, a better graphics card might. To appreciate it, you have to immerse yourself in it, give it time to reveal itself and to reward you. With that being the case, it's no surprise that most of us have grown habituated to so-so Realtek audio chips spliced into motherboards like an unimportant afterthought. Some people think we're used to terrible music because of the compressed MP3 format, but I reckon it has a lot more to do with the sources from which we listen. Recent times have seen a revival in audio appreciation, however, especially among phone manufacturers who are starting to put sincere effort into crafting great portable music players. But if you buy a pair of high-end headphones to listen to, say, your HTC 10, that poses an additional challenge: what's to be done about the PC or Mac you already own that doesn't sound as good? The answer isn't free, but it's worth every cent: you buy a USB sound card. 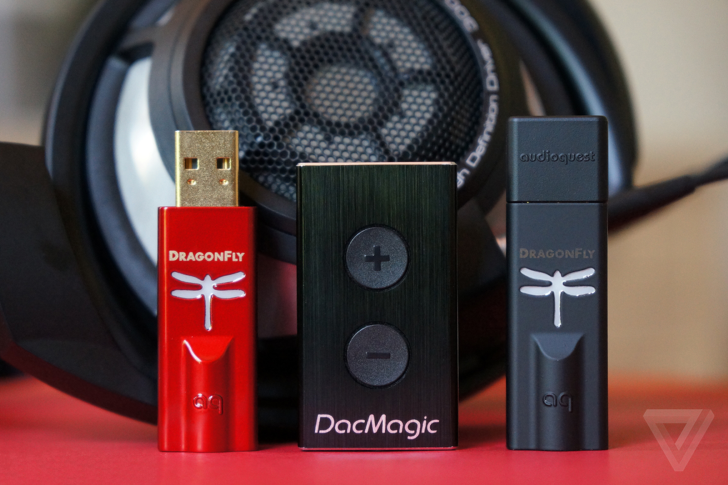 I've been testing two of the most endearingly compact USB audio enhancers on the market: the Cambridge Audio DacMagic XS and the AudioQuest DragonFly. What do they do? Well, both serve as a digital-to-analog converter, turning the 1s and 0s of digital music into the electrical signal headphones need to play music. Both are also surprisingly powerful headphone amps, upgrading the quantity of your laptop or desktop's sound as well as its quality. In price order, a black DragonFly costs $99, a DacMagic XS costs $120, and a red DragonFly tops the list at $199. I'm in love with the sound of all three and have no reservations in recommending them. Here are the differences: the cheaper DragonFly has a lower 1.2V output and is thus suitable for most, but not all headphones; its beefier sibling has a better DAC chip inside it and reaches 2.1V to be able to drive even true audiophile headphones like the 300-Ohm Sennheiser HD800 S. The DacMagic XS is rated at 2V, but actually gets louder than both of its AudioQuest competitors, offering 54 discrete volume levels and its own built-in controls. All three have ESS Sabre DACs, however the Cambridge Audio dongle uses a 24-bit ESS 9023 versus the 32-bit 9010 in the DragonFly Black and 9016 in the DragonFly Red. AudioQuest's current pair of DragonFly models is the third generation of the critically acclaimed DragonFly series, with its big change being higher efficiency allowing for smartphone compatibility. You'll need an adapter to make it happen, but both the black and red DragonFly modules can take the audio from your iOS (5 and above) or Android (4.1 and above) device and turn it into sweetly detailed music. When you consider, for example, that Audeze charges $100 for its Cipher DAC cable for the Titanium EL-8s — which works only with that pair of cans and Apple Lightning gadgets — the price of these DACs doesn't seem unreasonable at all. I've listened to the EL-8s through the DragonFly DACs and I'd say you need the red model to truly power them to their fullest, but otherwise, they're every bit as good as they are with their custom-designed cable. I've seen mention online of the DacMagic XS also being used with phones, but Cambridge Audio doesn't advertise it as suitable for that purpose. 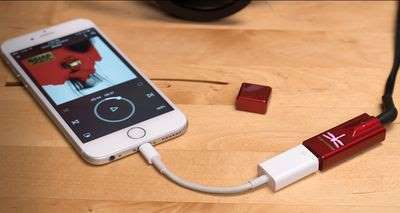 The premise behind AudioQuest's USB sticks and the Micro USB-connected DacMagic XS is to instantly and effortlessly upgrade the typically neglected sound of your computer. All I can say is that they succeed. Each of these little wonders brings greater clarity and transparency to my music, widening the soundstage and sharpening every detail. The comparison to a generic audio chip is akin to cleaning the lens on a camera: everything is just that little bit better and crisper. And honestly, you can't forget the importance of greater power too. Headphones like the aforementioned HD800 S and Titanium EL-8 will never show off their best quality when plugged into the standard headphone jack of a laptop or an iMac. These USB DACs are the entry level of their category and are therefore practically barren in terms of added features. AudioQuest's parts have a male USB jack on one side and a headphone port on the other and that's it. Their only moderately smart feature is the dragonfly logo itself, which lights up in different colors depending on the bitrate of the music being played back. The DacMagic XS also has an indicator light confirming sample rate, but beyond a pair of volume buttons, it's just as simple. I personally love that simplicity about both of them. Instead of giving me extras to pad out the price, both companies have just said, here's some brilliant audio processing for your computer in a stupendously small package. Because they are so uncomplicated, these DACs make an excellent purchase as a gift as well. Their instruction sheet can fit inside a single WhatsApp message, and they are the very definition of portable electronics. My DacMagic XS review unit is the older design, which has been succeeded by one without the brushed finish, but almost identical aluminum construction. There's now a choice of five colors (including cyan, so I'm expecting Chris Ziegler will be buying one), though none of them signify meaningful difference as the DragonFly's do. If you want me to pick between the sound of the DacMagic XS and DragonFly models, I'd have to give the slight edge to the DragonFly. This is highly imprecise, but I simply had more moments of "damn, I'm really enjoying this" while listening to them absent-mindedly than with any other source. The choice between which DragonFly you might want depends solely on how demanding your headphones are. If you're only going to listen to efficient cans already designed for portable use, go with the black DragonFly, the cheapest of the three, and enjoy your life. Otherwise, maybe the volume controls of the DacMagic XS and higher volume ceiling will prove more important to you. Headphones are and will always be the most important component of any personal audio setup. But every complex system is only as good as its weakest link, and USB DACs are a great way to eliminate what's traditionally been the feeblest part. You won't need high-end headphones to be able to appreciate the improvements of a better sound card, but to truly get the most out of the DragonFly or DacMagic XS, I very much recommend matching them with a suitably awesome pair of cans. They've given me a whole new appreciation for the precision and transparency of planar magnetic headphones like the Audeze EL-8, and I don't think I'll be going back to my computers' native audio sources anytime soon. Or ever.